The cliffside route between Inverbervie and St Cyrus has been severely damaged by storms and coastal erosion over recent years. Many sections are now unsafe to walk along, with some completely impassable, and its parlous state has now led to fears it could disappear entirely without action. To ensure that does not happen, Visit Mearns has set its sights on restoring and maintaining the path. A coastal trail sub-group has been awarded £10,000 through the Tullo Wind Farm Community Fund which it will use to begin work on upgrading the stretch of path between Johnshaven and St Cyrus. Nigel Taylor, chairman of the organisation, said there was huge potential for the trail to be a popular facility for visitors once more. He said: “What we want to do is to reinstate it as a viable attraction, both for visitors close to home and from further afield. “Every area of the path is different and some parts require more work than others but we do know it’s not going to be a one-off fix. “It will be an ongoing thing and will require a long-term commitment from the group. “We’ll bring in specialist contractors for the heavier work, while some of the smaller work will be carried out by volunteers. The fresh plans come after similar work was carried out on the trail from Inverbervie to VisitJohnshaven. 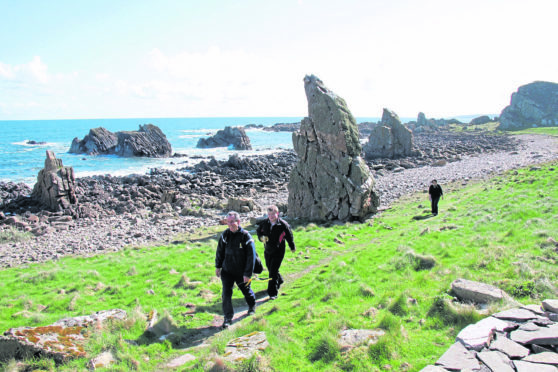 The group hopes that, once the wider route is improved, an increasing number of tourists will be attracted to the area, providing a welcome boost to local businesses. It’s also hoped the path will help link the various communities along the way more successfully, leading to them taking a greater interest in maintaining their own stretch of path. The medium to long-term project will include repairing and restoring paths, fencing, bridges and handrails. Plans are also in place to install new benches, signage and diversions around dangerous areas. The group intends to provide information boards to help path users identify and understand the challenges the natural world faces along the coast. It is also hoped that the initiative will draw more attention to the rich historical and natural heritage of the area. For more information about the path and the conservation effort, follow Our Mearns Tourism Association (OMTA) on Facebook. A new website, www.visitmearns.com, is due be launched later this week.